Elvis Costello released his first album “My Aim Is True” in 1977 at the age of 23. It had great success in its native United Kingdom and according to the website Pitchfork is “held by many as the most impressive debut in pop music history”. Between his debut and his second release “This Year’s Model”, Costello earned himself the reputation as “an angry young man” when during a performance of his single ‘Less than Zero’ on the American television program Saturday Night Live, he stopped mid-intro and instead played his song ‘Radio Radio’. Around this time he also protested the fact that he wasn’t signed to an American label by setting up out the front of a London convention of CBS records executives and busked until someone listened. He was arrested but it worked and within a few months he was signed to CBS’s Columbia Records. An angry young man maybe, but a smart one at that. For “This Year’s Model” Costello brought together a group of backing musicians under the name “The Attractions” who would continue to back him from 1978 to 1986. 1978 saw Costello release his second album “This Year’s Model”. He was noticed with “My Aim is True” so the expectations were high. He was 24 when this album was released, which is a pretty interesting age. It’s a time where you still have plenty of angst to throw at the world but there is still a certain level of naivety. At 24 you still believe you can change the world and it’s that brazen belief that you can which means you are actually able to. Costello was in good company with a lot of classic albums being made by young men that age. Kurt Cobain of Nirvana with “Nevermind”, Black Francis of The Pixies with “Doolittle”, Mick Jones of The Clash with “London Calling”, Bob Dylan with “Highway 61 Revisited”, Bruce Springsteen with “Greetings from Asbury Park, N.J.”, Michael Jackson with “Thriller”. “This Year’s Model” could have been a disaster for Costello. There aren’t many artists that can put forth such vitriol within their lyrics and yet have you there backing them the whole way. To do that with a whole album is almost unheard of. Costello’s first album “My Aim Is True” is a much more accessible album, but for me “This Year’s Model” is a much stronger album. Yes the subject matter is a little tough but it’s rare to find an artist willing to risk album sales in order to release an album that they believe in and that actually means something to them. Costello was a smart kid who had a lot to say. He was smart enough to do so in a way that related to what was happening around him within the music scene, embracing the New Wave and Punk culture. With his lyrics he takes stabs with his poison pen whilst his impeccable band keep up every step of the way. Musically on “This Year’s Model” the focus is predominately on bass, drums as keyboard, rather than guitar up front as was the case on “My Aim is True”. This album is such a classic because it takes risks. It’s when an artist truly connects with what they are singing about and pays no attention to what the critics or record company may think that we see brilliance emerge. Here Costello shines a light onto the darker and not so nice aspects of relationships. We’ve all been scorned at one time or another and we’ve all felt the satisfaction of getting one over an ex-lover we feel has done us wrong. On ‘This Year’s Model” Costello does so delectably over 12 tracks, never once flinching or apologising for what he has to say. It is the perfect balance of raw energy and sophisticated pop writing. Costello’s voice has such depth that it’s hard not to be drawn into every little thing he has to say. There is a good reason that at the age of 58 he is still releasing brilliant albums and touring sell out shows. There are not many artists that pass the test of time, but Costello does so brightly. I can safely say I’d never deliberately listened to Elvis Costello before. I know literally nothing about him, which is quite unusual for me. In a way I kind of prefer approaching an album with no preconceptions on what I’m going to get. Wikipedia tells me “This Year’s Model” is punk rock, I’m not convinced. It’s much too musically adept to be punk. The only thing punkish about it is Costello’s voice that sometimes gets a little raw. This is the perfect length album for me, not even testing my attention span with about three minutes a song. The whole thing is over in 35 minutes. It came in at number 98 on Rolling Stone’s ‘500 Greatest Albums of All Time’, and while I think it’s a good album, I can’t help but feel that’s a little high. My favourite track was ‘(I Don’t Want To) Go To Chelsea’, which was dumped from the US release for being “too English”… I like the kind of reggae feel that’s going on there, and for some weird reason I even could stand the organ noise! ‘Lipstick Vogue’ is another song I really enjoyed, right from the first beat of the intro drum solo. The frantic pace of the song contrasts with the cut in the middle of the track, building to a solid crescendo. I reckon everyone involved in playing this song would have had a great workout! Usually with most albums I can find a track that didn’t do anything for me. I tried and tried with this one and got debuted every time. There wasn’t one that took away from the album in any way, or was away from the themes throughout. 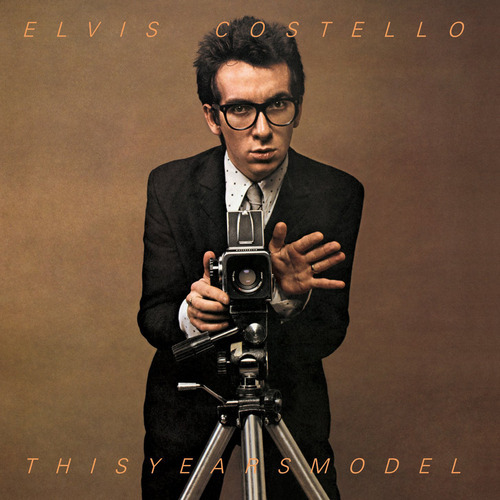 “This Year’s Model” has lead me to check out Elvis Costello’s work some more. Reckon I’ll dig it. Apparently “This Year’s Model” is supposed to be one of the greatest albums of all time (number 98 on the Rolling Stone list, thank you very much! ), but I truly couldn’t get into it, despite about 4 listens. I can understand why it was so popular and the legacy it left behind, but Elvis Costello’s nasal tones and constant whingeing really got on my nerves. He sounds like he’s swallowed a tennis ball and it subconsciously made me want to clear my throat! The album presents as a blend of softish punk rock and new wave with a hint of reggae added in and it’s easy to see the influence that it has had on later bands and albums. Throughout the album, Costello seems to either mock, complain about or criticise social issues and inflictions, commercialism of the music industry (‘Radio Radio’), and in some cases airs out his own laundry. Costello draws on his own personal experiences and somehow manages to channel them into ballads and punk rock jams. The only song that really caught my interest was track 4, ‘Pump It Up’. It is actually quite a good song with a rocking rhythm section and recognisable riff but was somewhat ruined for me, owing to the fact that the terrible Australian band Rogue Traders sampled the same riff from this song in their tragic pop hit ‘Voodoo Child’. Overall I wouldn’t say that I enjoyed this album, nor would I revisit it. Having said that, I get what Costello was hoping to achieve and he certainly gave a great insight into human emotion. It’s just not for me. I’m a big Elvis Costello fan, and I’ve seen him live a few times, but I’ve never really warmed to this album. After about five listens this week I think I’ve put my finger on what my issue with “This Year’s Model” is. Almost every song deals with matters of the heart, but there are no neat little tales of love here. All the emotions in relationships, fractured and/or fleeting, are on display, including lust, betrayal, cruelty and promiscuity. Because of this harsh spotlight on the shades of grey, EC’s songwriting creates an unsettling mood. Right from the album’s opener ‘No Action’, we are presented with unresolved (sexual) tension: “Ev’ry time I phone you/I just wanna put you down”. ‘The Beat’ has the song’s protagonist struggling with guilty feelings after a one night stand at a nightclub and the reggae-infused ‘Living In Paradise’ documents the habits of a jealous stalker. As these tracks are quite a shift in tone from his excellent debut, which was released the previous year, EC recruited a different group of musicians. He’d recorded “My Aim Is True” with a band called Clover, whose core members would go on to form Huey Lewis and The News. For “This Year’s Model”, EC assembled The Attractions, who would record with him for most of the 1980’s. Their frantic energy on this album comes together with a kind of organised chaos. The flashy, but excellent drum work of Pete Thomas perfectly fits with the thumping basslines of Bruce Thomas (no relation). Floating above the throbbing rhythm section is keyboardist Steve Nieve, whose distinctive sounding organ would help define EC’s new wave sound. The best songs on this album for me are ‘Radio, Radio’, ‘Pump It Up’ and EC’s wonderfully scathing ode to the poser ‘(I Don’t Want To Go To) Chelsea’. Every week we’d like to hear your thoughts on the album. Just click on one of the links below, or leave a comment here to have your say.